Integration with Zapier is easy, using our HTTP POST wizard. 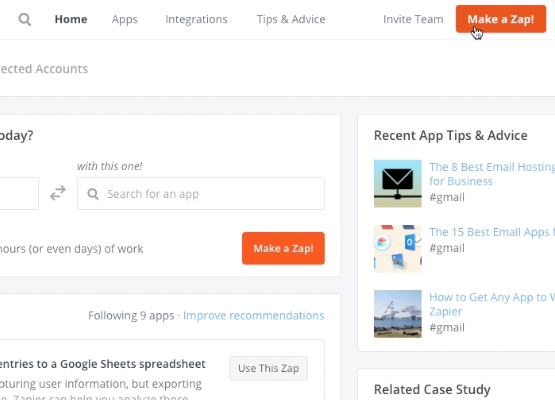 Zapier simplifies the integration and automation of 1000+ apps. You can use Zapier to connect Asana with dozens of tools your team uses: Evernote, Trello, Gmail, Twist, JIRA, Salesforce, Slack, and more — all without writing a single line of code. Review the steps below and follow along to integrate with Zapier. This integration uses our HTTP POST Wizard to POST data to Zapier. We're also working on an updated native integration coming soon! In Logiforms setup a 3rd party integration via the HTTP Form Post. Now that your setup, each time your form is submitted (or when the rules match), your data will be posted to Zapier. You can also kick of a Zapier Post via a trigger. This can be done based on any combination of logic, or via a button click in a workflow.